The Ribit team descended upon CeBIT Australia on 17 May 2018, as the official Student Jobs Networking Partner. Over a 100 tech companies looking for students for jobs flew a green Ribit balloon and participated in an exclusive student networking event. Students from a range of disciplines including coding, technology, finance, business, marketing, creative design, customer liaison and admin, got the opportunity to talk to big technology brand names and emerging, exciting small businesses and start-ups! 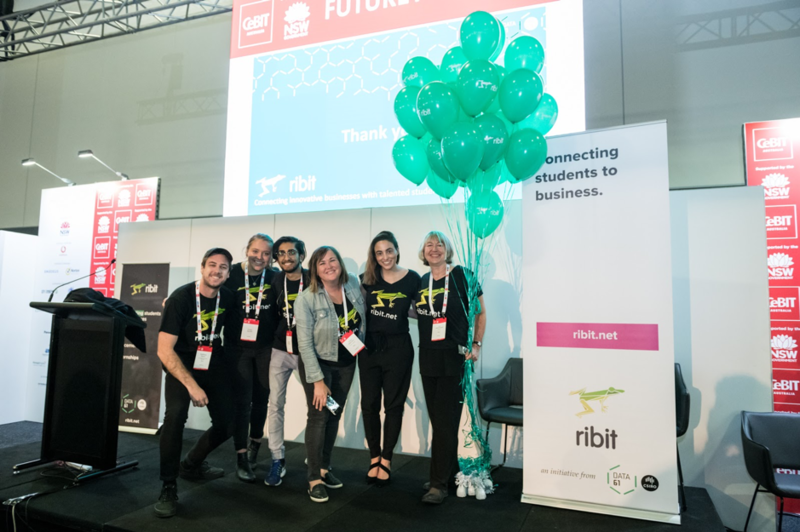 Ribit Business Lead, Peta Portelli also gave a great seminar to the startup community at CeBIT on the Future Tech stage on how to attract, engage, retain and make the most of the millennial workforce. A massive thank you to our partner CeBIT Australia – one of Australia’s largest technology conferences and exhibitions! We also thank the Department of Industry, Jobs4NSW (aka Entrepreneur HQ) and the StartHouse (Newcastle-Hunter startup community) for their support on the day. And to all the companies that participated in the event, we are delighted we were able to connect you to the future talent pipeline of students that will help your companies grow and innovate.